The warm-up area can be the most intimidating part of a show. 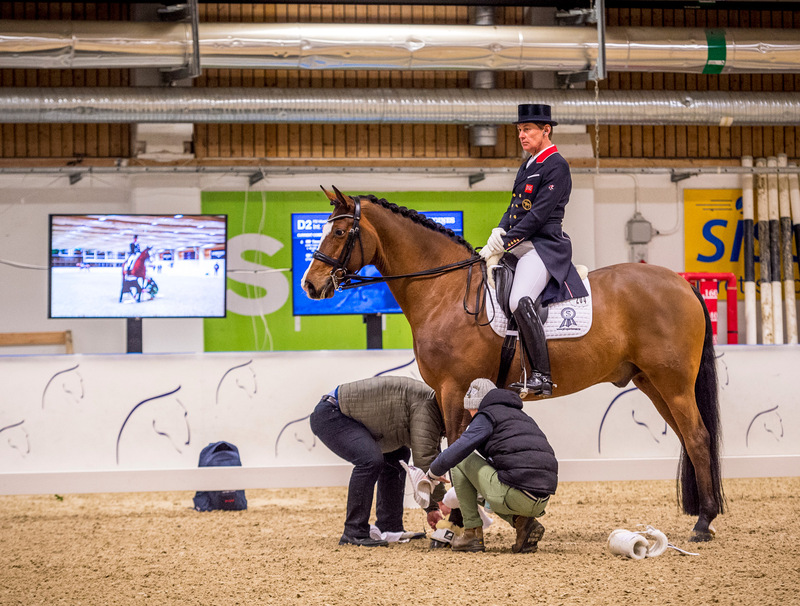 Even at well-organised venues where the arena is often spacious, supervised and generally pleasant, you still have to deal with the pressure of warming your horse up well before you enter the competition ring. At less organised venues, the warm-up arena can often be chaos – with horses kicking and getting excited in cramped conditions. No matter what the situation though, it’s up to you to try and get the best out of your warm-up time. You paid good money for your show, so you want to do everything you can to ensure things go smoothly. And, as we all know, shows are often won on a good warm-up. If you only ever school or jump at home by yourself in a quiet place with no distractions, your horse is going to find it very hard to keep his composure in a crowded warm-up arena. Even horses who have been going to shows for years can benefit from working in a group more often. If your horse gets flighty or excited with other horses, DON'T let it put you off! In fact, that’s a sign you need to do it more often. There’s absolutely nothing worse than arriving at a show late and having to throw on your tack and canter down to the warm-up arena for a five-minute whizz around before going in to compete. Not only does it automatically put you into a bad frame of mind, it also means you haven’t given yourself or your horse the best chance possible. Make sure to always allow extra time for travelling and loading, as well as enough time to organise yourself once you get to the show. Add at least half an hour onto however long you think you’ll need to be on the safe side. This is extra important if your horse is young, inexperienced, or generally a more highly-strung type. Some horses need to get into the warm-up and immediately go into an active trot with lots of bending and flexing to get them to focus on their riders and ignore any distractions. Other horses need to spend 15 minutes walking around before they can be expected to go up a gear without getting too fresh. Some might need a lunge before leaving, and some might need to stand around for an hour at the show before you tack up. Of course, a lot of this will be trial and error, but you should have a good idea of what will work just by knowing their personality and taking your day-to-day activities with your horse into consideration. If you normally loosen your horse with a long rein in canter, do that at the show as far as possible too, instead of immediately gathering your reins and asking for trot leg-yields. Of course, the situation will be slightly different so you will have to use your discretion a little, but if you know what works then try to stick to that and only make slight modifications. It can be helpful to work on a warm-up routine at home, so that your horse settles with the familiarity of his work when he gets to a show. Just don’t warm up ‘like you do at home’ to the detriment of other riders… which brings us to our next point! Know the warm-up etiquette in your country or region. In many countries, the usual rule is to pass left to left. This means that as you go past each other, your left shoulders will be closest. If this is the rule, don’t try to change things up by going past someone on their right-hand side, even if it seems easier. There are exceptions, of course. If a rider is circling, they should stay inside the other riders – so don’t go weaving through their circle just to pass left to left. If you are walking, you should generally stick to the inside track to allow riders who are trotting or cantering to pass. Remember to put a red ribbon in your horse’s tail if they are likely to kick, but also remember that even if a horse doesn’t have a ribbon, riding very close behind another horse or passing close enough that two riders could touch stirrups could cause a normally-polite horse to kick out, so keep a safe distance at all times and be aware of other horses and riders. If you need to come to a standstill to put on a jacket, to discuss something with a friend or instructor or to watch another round or test – LEAVE the warm-up arena to do so. Don’t stand in the corner of the arena and cause a traffic jam. Finally, look up! If you’re staring down at your horse’s head, you are far more likely to crash into someone. So many riders go into the warm-up area and proceed to do a good flatwork session and then jump their horses multiple times over crosspoles, verticals and oxers of varying height and width. While you do need to make sure they are listening, feeling good and sufficiently warmed up to prevent injury, you don’t want to work so hard in the warm up that there’s nothing left in the tank for the ring. For experienced horses, jumping five or six efforts is often more than enough. The same goes for Dressage – the line between feeling ready and feeling overtired can be very thin, so make sure you have a rough idea of how much work your horse needs before he peaks and more importantly, learn to recognise the feeling of when your horse is ready to do serious work but not too tired to perform. Remember, the horse isn’t going to learn anything new in the time it takes you to warm up before you compete, so there’s no need to jump practically a whole course or run through every movement in your test five times before you go in. Run over your Dressage test in your mind, let your horse stand outside the arena for a minute or two to see anything spooky or unusual – or watch a couple of Jumping rounds and make sure you have the course straight in your head. Take a minute to relax, calm yourself and make sure you are feeling positive before entering positively and getting ready to wow the judges and spectators!